Our practice consists of two highly qualified and trained orthopedic surgeons. Dr. Ira Chernoff and Dr. Marc Chernoff are both fellowship trained in the specialty of spine surgery. These two brothers have many hospital affiliations as well as several offices in order to serve the Long Island and Manhattan areas. Dr. Ira Chernoff graduated with his medical degree in 1982 from State University of New York – Downstate Medical School, New York, New York. He then completed his residency in 1987 at University Hospital at Stony Brook, Long Island, New York. 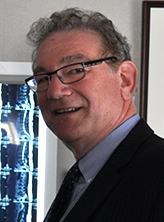 Continuing his education, Dr. Chernoff completed his spine fellowship at Hospital for Special Surgery / Cornell Medical School in 1988. Dr. Marc Chernoff graduated with his medical degree in 1993 from State University of New York at Stony Brook, Long Island, New York. He then completed his residency in orthopedic surgery at University Hospital at Stony Brook. Continuing his education, Dr. Chernoff completed his spine surgery fellowship at Harvard Medical School, Boston, Massachusetts. Both Dr. Marc and Dr. Ira Chernoff helped me though a rough time. They were both caring and very knowledgeable in every aspect. Through the whole process anytime I had a problem or needed them all I had to do was call. They always got back to me. Truly, if it wasn’t for them, I don’t think I would be walking now. Office staff always very friendly and accommodating. I feel very lucky that when I was admitted into the hospital I got the Chernoff team as my surgeons!! Both doctors Marc and Ira are honest and upfront. They explain everything and also are very good listeners. I had neck fusion and was up and about in weeks time. Everyone in the office in Stony Brook is kind and compassionate. You are seen very quickly- there’s no waiting in the office for someone to see you. I required surgery and I am 100% back to where I was before my herniated disc began to cause me great distress. Best caring doctors (Marc and Ira Chernoff) before during and after surgery. I suffered excruciating pain for a year looking for an orthopedic doctor that I felt confident and comfortable with to even do the surgery I needed. The caring doesn’t even stop there. Linda from billing helps with insurance problems and questions, so you can focus on getting yourself better. Nice to know you’re not looked at like just another patient. I’m so thankful. Both Marc and Ira are great doctors. They worked on me 2 times. They both said the same. They tried and helped me. Everyone should go to them. They are in the same office, and they are bothers that are great doctors and great staff.